The six-island archipelago, situated in the middle of the Mediterranean sea consist of, Malta 246 km2 (95 miles2), Ghawdex (Gozo) 67 km2 (26 miles2), Kemuna 2.7 km2 (1 mile2), Kemunet, St. Paul’s Islet and Filfla of which, only the first 3 are inhabited. Total area is 316 km2 (122 miles2). The coastline of Malta is well indented, thus providing numerous harbours, bays, creeks, sandy beaches and rocky coves. The length of the shoreline round Malta is 136 km, and 43km round Gozo. Generally low-lying, rocky, flat to dissected plains. Many coastal cliffs - highest point Dingli Cliffs 245 metres. No rivers or mountains. Well indented coastline. The Maltese Islands host some of the most magnificent buildings ever built, indeed, the oldest free-standing buildings in the world, that pre-date the more famous pyramids of Egypt. The megalithic temples are witness to the first Maltese culture, revolving around the spiritual belief in the Goddess of Fertility. Their strategic location, bang in the centre of the Mediterranean Sea, makes up for all the lack of resources that nature endowed the rest of the globe. Malta, the largest island, and her sister islands of Gozo, Comino, Filfla and other very small islands, are in the middle between Southern Europe and North Africa, and between Western Europe and the Middle East. The archipelago was first colonised thousands of years ago, and have often played a crucial role in the making of world history. The combined population of Malta and Gozo totals up to around 385,000. 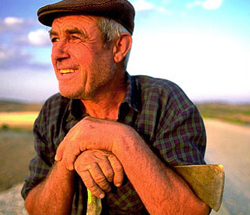 Ethnically, the Maltese people are quite an extraordinary mixture. Throughout the Islands long history, the many races that have settled here have left their indelible marks. Thus the Maltese are among the most cosmopolitan people in the world. Nonetheless, there remain definite characteristics, which are … and always have been … distinctly Maltese both culturally and physically. The Maltese character is gregarious and amiable. We love visitors and will go out of our way to make strangers feel at home. Nearly all Maltese are Roman Catholics and the influence of the church isnot what use to be. Every town and village has its own church…. Some of these are large and imposing … for example the parish church in the town of Mosta has the second largest unsupported dome in the world. During the summer months each town and village celebrate the feast day of its particular saint. These are coluorful occasions with the whole population of the village en fete. Religion seems to be as much a part of life as eating and sleeping. Tolerance is another character trait, which has been honed over generations of foreign occupations.. Most first-time visitors to the Maltese Islands remark on the friendliness and almost naïve openness of the people. When you live here you realize that it is no act, put on for the sake of the tourist. 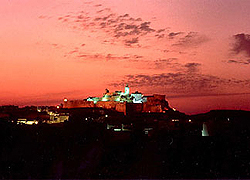 Neighbours will always look out for one another … they will knock on the door on their way to the shops to ask if they can getting anything for you … they take messages happily … look after your children and pets … and generally become very protective towards any non-Maltese living in their community. Tourists to Malta … who later become permanent or temporary residents here do so for the overwhelming reason that they are made to feel welcome … and that … in a nutshell, sums up the character of the Maltese people. 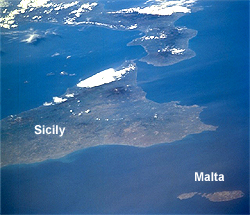 Sicily (Catania) is from 3 to 9 hours sailing time from Malta, depending on the type of craft used. 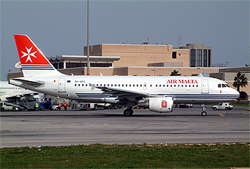 Air Malta, Lufthansa and Alitalia are the principal air carriers. Malta is on 'Western Europe' time, which means that the islands are normally one hour ahead of Greenwich Mean Time. Between the last Sunday in March and the last Sunday in September the clocks go forward one hour. Malta's summer time thus puts the islands two hours ahead of Greenwich Mean Time for this period. The Maltese Islands have much to offer the experienced diver as well as being an ideal location for beginners. Easily accessible from all European capitals, the waters around the Islands are tide-free, warm, clear and safe. Visibility often exceeds 30m and the underwater scenery and fauna are varied and spectacular. 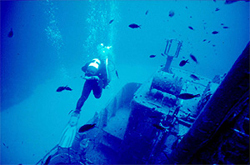 The choice of dive sites includes caves, drop-offs, cliff sites and wrecks - by day or night and by boat or from the shore. A safe and enjoyable location can always be found, even in the winter months. Government regulates sport diving. Local professional and commercial dive centres are fully equipped to provide well-maintained equipment; clean air, instruction or accompanied dives and qualifying courses to internationally recognised standards. Government policy requires all divers to obtain a local diving permit or C-card, issued by the Department of Health for a nominal fee of Lm1. A current medical certificate, 2 passport size photos and diving logbook/qualification record showing a minimum of CMAS 2 Star and an application form are required. If accompanied by a locally qualified instructor the C card is not necessary. Such permits are renewable annually every 1st January, and specify the various conditions to be observed for the safety of participants and the sport in general. Forms and information may be obtained from the Department of Health, Hyper baric Unit, St. Luke's Hospital, G'Mangia, Malta, Tel (00356) 2123 4765/6. Alternatively, all local dive centres will be happy to handle all necessary arrangements on one's behalf. After proceeding to the visitors berth, the yacht's registration book, together with passports covering all crew members and passengers must be presented to Customs and Immigration officials who will call on the yacht as early as possible to issue the necessary practique. 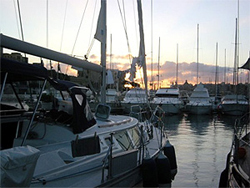 Yachts may only remain on anchor in mid-stream within the Yachting Centre until a specific berth is allotted by the Berthing Master who must be contacted at the Yachting Centre Offices or on VHF channel 09. Most popular, Football, Waterpolo and Basketball. Apart from these mentioned a variety of other sports are also practiced.